The NFL turned America’s TVs into high-def snow globes on Sunday afternoon. There were five simultaneous snow games, by far the most since 1991, according to Stats LLC. On only two other occasions since then have there been even three snow games: Nov. 24, 1991 and Dec. 13, 1992. The Lions and Eagles in Philadelphia got the worst of it-or maybe the best from the perspective of those watching from the comfort of home. The snow buried field markers, made it nearly impossible for quarterbacks to find receivers downfield and caused Detroit to cough up seven fumbles in the 34-20 Eagles victory. The other snow games were relatively high-scoring too: Miami beat Pittsburgh 34-28, Green Bay edged Atlanta 22-21, Kansas City routed the Redskins 45-10 and Baltimore beat Minnesota 29-26. 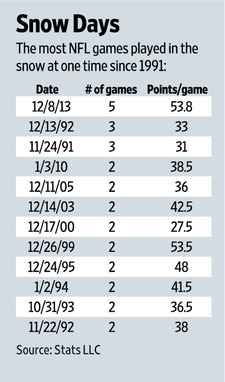 The average of 53.8 combined points in these games is more than any other snowy Sunday since 1991. Before Sunday, only 30 snow games have been played during the regular season since 2000. The white stuff has been welcomed by defenses, as those games had an average of 38 combined points. But once offenses got acclimated to the conditions on Sunday, they dominated even more than usual this year. The Vikings and Ravens scored five touchdowns in the final 125 seconds of their game, and the Eagles stunned the Lions with 28 fourth-quarter points. With all that behind us, here are the FANFOOD Fantasy Football 3 IN/OUT results for week 14 followed by a recipe for Grilled Holiday Prime Rib. Bobby Rainey rushed 22 times for 127 yards and a touchdown and caught three passes for a combined loss of four yards in the Bucs’ Week 14 win over the Bills. Rainey opened the game with an 80-yard touchdown run on his first carry, demonstrating surprising long speed in addition to his solid tackle-breaking ability and improving versatility. Brian Leonard did have seven carries in this game, though they were mostly in garbage time of the 27-6 stomping. A true feature back in Tampa Bay’s balanced offense. Rashad Jennings never fully passed the NFL’s concussion protocol despite practicing each day last week. Jennings was cleared to practice, but not play against the Jets. He did make the trip to New York in hopes of getting the green light over the weekend. However, “it was kind of apparent [Saturday] that he wasn’t going to be cleared to play,” coach Dennis Allen said. Jordan Reed (concussion) was inactive for Week 14 against the Chiefs. Reed told reporters on Friday that he “felt a lot better” and expected to play, but instead he missed his third straight game. It’s always a concern when a concussion lingers the way Reed’s has. With the Redskins’ season in the tank, they could consider shutting their rookie tight end down for December. Donald Brown rushed for 11 yards on four carries in Week 14 versus the Bengals. Brown added four catches for 18 yards on six targets in the passing game. He started for the Colts and handled the first two series before Trent Richardson came in and saw plenty of work out of the backfield. Brown couldn’t get anything going and has been held in check for the most part in his two starts. Lamar Miller sustained a concussion during Sunday’s Week 14 game at Pittsburgh and did not return. Miller took a big hit early in the third quarter and got up very slowly. It wasn’t clear if he lost consciousness, but the Dolphins announced the concussion about 30 minutes later. Miller’s day was done with six carries for 20 yards and two catches for 13 yards, as he shared work with Daniel Thomas even before the injury. Miller will be in a race to get cleared ahead of a Week 15 home game against the Patriots. Once the strength of a surprisingly competitive team, the Oakland Raiders DST has fallen flat and so have the fortunes of the franchise. A New York Jets team which was ranked 31st in scoring with 46 points in its previous four games and two field goals to show for its preceding eight quarters, beat the Raiders 37-27 at MetLife Stadium Sunday. Seven of the Jets’ points came on a blocked punt recovered for a touchdown, but the rest were attributable to a defense that hasn’t been able to get off the field for the last three weeks. In three consecutive losses, the Tennessee Titans, Dallas Cowboys and Jets have combined to convert 24 first downs in 44 opportunities. The Jets, who came on a 1-for-19 streak, were 7 of 13 with rookie quarterback Geno Smith. They scored a paultry 2.70 points for your fake squad. This Old English cooking method is a classic prime rib recipe that uses salt and pepper. Lots of salt, actually. Prime rib is called prime because of the cut, not the quality of the meat. You can get different grades of a primal cut of meat that happens to be along the ribs. Cut this same hunk o’ meat into thinner cross sections, and you have ribeye steaks. The main difference in cooking ribeyes versus prime rib is that the outside of the steak is seared all over, while, with prime rib, only the edge can be seared for most servings. So, if there’s a method of cooking that doesn’t sear, but instead adds other value to the cooking process, it might be worth exploring, don’t you think? This method uses a salt crust to protect the meat while cooking. The crust helps ensure that the meat isn’t over-smoked, it provides a salty edge that tastes great, and it serves as something of a heat buffer that helps promote even cooking. Often, the middle of a prime rib will be medium rare, while the meat is gradually more well done as it reaches the edge of the prime rib. The salt + lower temperatures = more even doneness…the best-yet prime rib! Preheat the grill with the indirect method (half the grill on) to 225 degrees, also placing an oak plank (ensure that it’s not treated in any way) on the grate. Pour the kosher salt onto a rimmed tray and drizzle water across the salt until a thick paste forms. With the prime rib bone side down, season with the black pepper and apply a thick layer of the salt paste, up to 1/2 inch, over the top of the rib roast, leaving the ends of the roast exposed. Carefully transport the prime rib to the grill and place on the oak plank. If salt falls off the roast, carefully reapply it. Remove the roast after the internal temperature reaches 120 degrees, as measured with a digital or meat thermometer inserted in the thickest part of the meat away from the bone. Foil and rest for 30 minutes. Remove the salt crust, and rub the roast with a paper towel to remove any remaining salt. Slice and serve with Sour Cream Horseradish Sauce. In a large bowl, mix sour cream, horseradish, champagne vinegar, chives, salt and pepper. Taste and add more horseradish if desired.